A Xian MA60 passenger plane, PK-MZK, was destroyed in an accident near Kaimana Airport (KNG), Indonesia. The airplane carried 19 passengers and six crew members. All on board were killed in the accident. The airplane operated on Merpati flight MZ8968 from Sorong (SOQ) to Kaimana (KNG), Nabire (NBX), and Biak (BIK). The flight took off from Sorong at 12:50 for the one hour and four minutes flight to Kaimana. Cruising altitude was 15.500 feet and weather forecast for Kaimana indicated rain with a visibility of 8 km, half of the sky covered with clouds with cloud base at 1400 ft, winds from the southeast at 6 mph (5.2 kts) and temperature of 29°C. At 13:25 the crew received updated weather information, indicating that visibility had decreased to 3-8 km, with cumulonimbus clouds at 1500 ft.
At about 13:37, MZ 8968 reported at 7 nautical miles from the airport, descending through an altitude of 8000 ft.
Five minutes later the Kaimana AFIS (Aerodrome Flight Information Service) officer informed the crew that it was still raining at the airport and the ground visibility was 2 kilometers. During the approach to Kaimana, the flight crew flew to the south of the airport in an attempt to make a visual approach. The auto-pilot was disengaged at 960 feet pressure altitude. At 376 feet pressure altitude, the crew decided to discontinue the approach and climbed, turning to the left. Engine power was increased and flaps were retracted from 15 to 5 and subsequently to 0 degrees. The landing gear was also retracted. The aircraft rolled to the left with a bank angle of 11° and continuously increased up to 38°. The rate of descend increased significantly up to about 3000 feet per minute and the airplane finally impacted into the shallow sea. Kaimana Airport has a single runway, 01/19 (asphalt, length 5249 feet / 1600 m) which runs parallel to the coast with the sea to the west and mountains to the east. The airplane crashed into the sea about 800 m southwest of the runway 01 threshold and 550 m from the beach. It broke up and sank to a depth of about 15 metres. The airplane had been manufacturer in 2008. It was stored at the factory in Xian until it was delivered to Merpati in December 2010. 1. The flight was conducted in VFR in condition that was not suitable for visual approach when the visibility was 2 km. In such a situation a visual approach should not have been attempted. 2. There was no checklist reading and crew briefing. 3. The flight crew had lack of situation awareness when tried to find the runway, and discontinued the approach. 4. The missed approach was initiated at altitude 376 feet pressure altitude (250 feet radio altitude), the pilot open power to 70% and 82% torque followed by flap retracted to 5 and subsequently to 0. The rapid descent was mainly caused by continuously increase of roll angle up to 38 degree to the left and the retraction of flaps from 15 to 0 position. 5. Both crew had low experience/flying time on type. 6. Inadequacy/ineffectivity in the training program may lead to actions that deviated from the standard procedure and regression to the previous type. 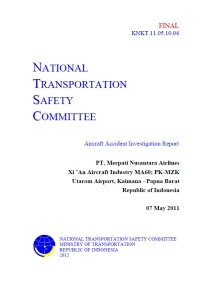 From 13-15 May 2011 the Indonesian Ministry of Transportation conducted a special safety audit of the Merpati Nusantara. Following the audit, it was concluded that the MA-60 met airworthiness standards and was safe to be operated. Also, the aircraft were maintained in accordance with the maintenance programme. However, the Ministry of Transportation recommended to no longer operate the MA-60 to Ende (ENE/WATE), Waingapu (WGP/WADW) and Ruteng (RTG/WATG). Approaches into these airports are considered difficult. The audit further revealed a certain level of indiscipline in cases were pilots for instance carried out approaches and landings in below-minima weather conditions. The Ministry recommended additional training for 77 MA-60 flight crew members. Distance from Sorong-Dominique Edward Osok Airport to Kaimana-Utarom Airport as the crow flies is 404 km (253 miles).